Staff Sgt. Kristin High/US Air ForceMembers of the Special Operations Community pay respects to a mural honouring Air Force Tech. Sgt. John Chapman. The US’s war on terror launched on October 7, 2001 with the invasion of Afghanistan, a campaign known as Operation Enduring Freedom. Throughout the 17-year war, 21 service members have received the nation’s highest award for combat valor. 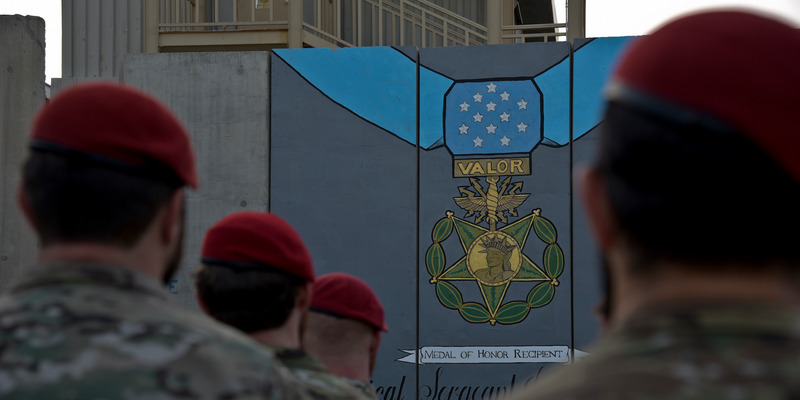 The Medal of Honour is reserved for service members who display extraordinary bravery or selflessness in conflict, often at the expense of their own lives. On April 4, 2005, President George W. Bush spoke to a somber crowd gathered to honour Army Sergeant First Class Paul Smith, who had died two years earlier during the Battle of Baghdad. During the ceremony to follow, President Bush presented the Medal of Honour to Smith’s parents, inducting their son into a venerated fraction of military service members and veterans. Smith was the first service member awarded with the nation’s highest military honour for his actions during the global war on terror. In the time since, 20 more have been awarded for conspicuous gallantry – an obvious display of bravery in battle that often shows disregard for one’s own life. Here are their incredible stories. On March 4, 2002, Navy SEAL Senior Chief Petty Officer Britt Slabinski’s helicopter was shot down over Takur Ghar mountain in Afghanistan. 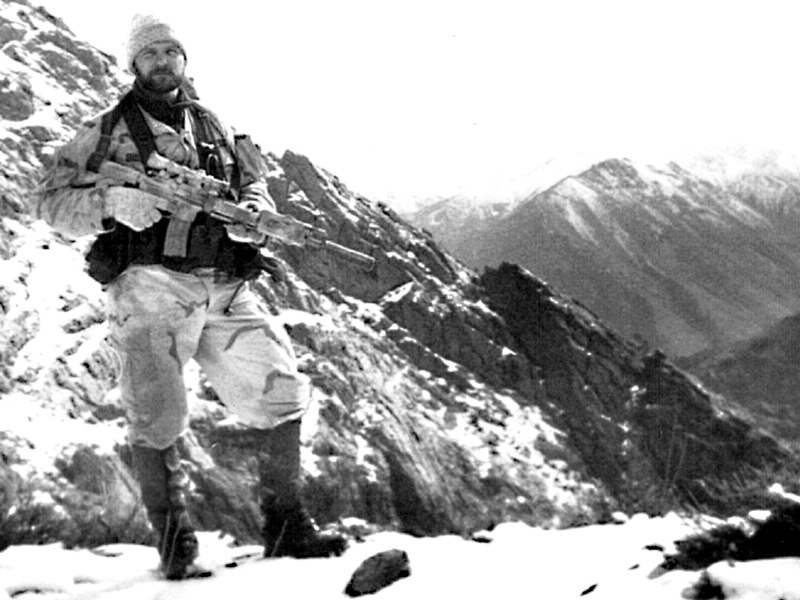 Through deep snow, Slabinski protected his teammates by fighting off insurgent forces, exposing himself to direct enemy fire throughout. At one point, Slabinski carried a wounded teammate to safety while calling in airstrikes for protection. 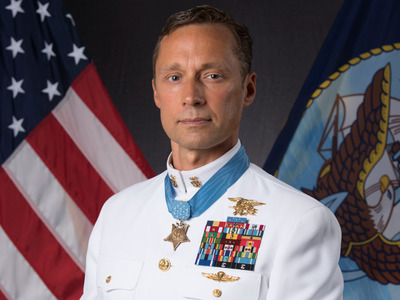 Originally awarded the Navy Cross, in May 2018 President Donald Trump upgraded the award to the Medal of Honour. 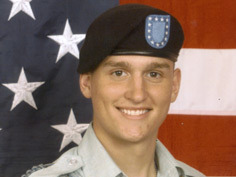 Air Force Technical Sergeant John Chapman was posthumously awarded the Medal of Honour over 16 years following his actions during the Battle of Robert’s Ridge on March 4, 2002. After a rocket-launched grenade toppled his team’s helicopter, Chapman led the effort to rescue one of his teammates who was thrown from the aircraft. 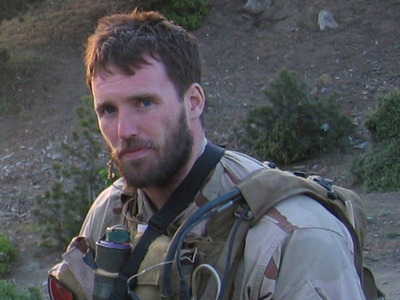 He fought for over an hour through enemy gunfire, ignoring numerous injuries in the attempt to save Navy SEAL Neil Roberts. Tech. Sgt. 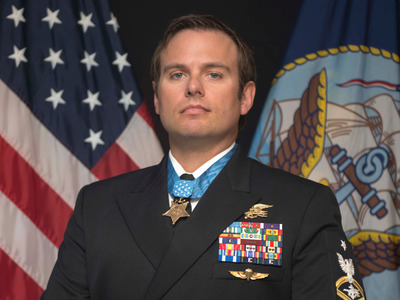 Chapman was originally awarded the Air Force Cross for his actions during the battle, becoming the first Air Combat Controller in history to earn that medal. The Battle of Robert’s Ridge resulted in numerous decorations, including 12 Silver Stars and three Air Force Crosses. President Donald Trump upgraded his award in August 2018, making Chapman the first member of the Air Force to earn the Medal of Honour since the Vietnam War. On April 4, 2003, Sergeant First Class Paul Smith coordinated the defence of over 100 US soldiers who came under attack near Baghdad, Iraq. Surrounded by enemy forces, Smith fought them off with hand grenades, anti-tank weapons, and a truck-mounted machine gun, exposing himself to direct enemy fire. He suffered mortal wounds while saving the lives of wounded soldiers, who were rescued while he provided protective fire. Sgt. First Class Smith was awarded the first Medal of Honour of the Global War on Terror by then-President George W. Bush on April 4, 2005. On April 14, 2004, Cpl. 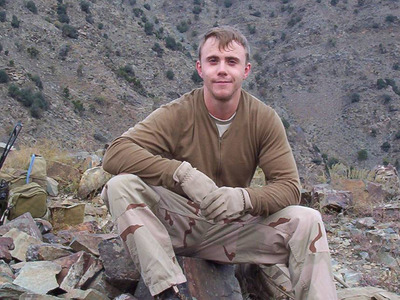 Jason Dunham jumped on top of a grenade to save the lives of two of his squad members. He survived the blast but died April 22 of injuries sustained. Guided missile destroyer USS Jason Dunham was named in his honour. On June 28, 2005, Lt. Michael Murphy and his SEAL team were surrounded by Taliban forces near Asadabad, Afghanistan. Realising his team needed support, Murphy ran into enemy fire to reach a clearing where he could call in support. He remained in his position as he fought enemy troops, and was mortally wounded while protecting his teammates. Guided missile destroyer USS Michael Murphy was named in his honour. 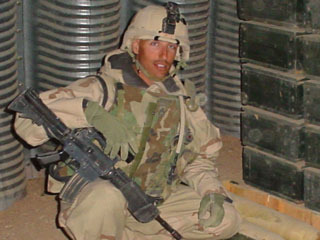 Sergeant First Class Jared Monti repeatedly ran into enemy fire to rescue a wounded teammate on June 21, 2006. Refusing to leave his fellow soldier behind, Sgt. First Class Monti died in Nuristan Province, Afghanistan, during his third rescue attempt. US Navy courtesy photoMichael Monsoor was posthumously awarded the Medal of Honour on April 8, 2008. On Sep. 29, 2006, Navy SEAL Michael Monsoor was standing guard on a rooftop in Ar Ramadi, Iraq when a hand-thrown grenade bounced off his chest. From his position, Monsoor was the only one who could have escaped the grenade’s blast. Instead of exiting, he jumped on top of the grenade to shield his two teammates. On Dec. 4, 2006, Private First Class Ross McGinnis and his crew were in the midst of combat operations when an insurgent threw a grenade into his vehicle. After alerting his crew, McGinnis pinned the grenade against the vehicle using his own body, shielding his crew from the blast. At the time of his death, Pvt. First Class McGinnis was 19 years old. 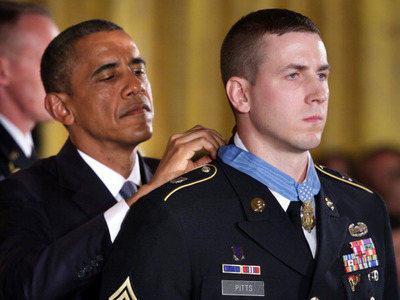 Win McNamee/Getty ImagesPresident Barack Obama awarded the Medal of Honour to Salvatore Giunta on November 16, 2010. When insurgents ambushed his unit, Staff Sergeant Salvatore Giunta repeatedly ran into enemy fire in order to administer first aid to wounded teammates. Alone, he noticed two insurgents attempting to carry a wounded American away. Giunta charged, rescued his teammate, and dragged him to safety. 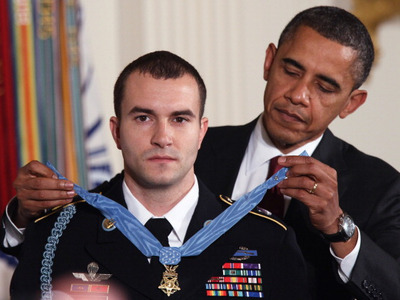 On November 16, 2010, Giunta became the first living person since the Vietnam War to receive the Medal of Honour. Trapped between a mountainside and a steep cliff, Sergeant Kyle White and his platoon were ambushed while walking along a narrow ridge in Afghanistan on November 9, 2007. Amid enemy bullets and grenades, White provided life-saving medical care to wounded teammates, scrambling to distract enemy fire and using his own body as a shield. He continued calling in airstrikes and a medical evacuation helicopter despite his own injuries, including shrapnel wounds and a concussion. 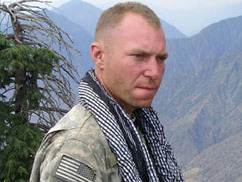 Green Beret Staff Sergeant Robert Miller and his patrol unit were ambushed by insurgent forces in Konar Province, Afghanistan on January 25, 2008. When his unit was attacked a second time, Miller directed his men to retreat, then turned and charged toward the enemy. He was mortally wounded while fighting off the insurgents, saving the lives of seven teammates and 15 Afghanistan National Army troops. Staff Sergeant Leroy Petry lost his right hand on May 26, 2008 when a grenade – which had landed only a few feet from his unit – detonated before he could throw it back. After losing his hand, Petry applied his own tourniquet and continued leading his team until the battle was over. 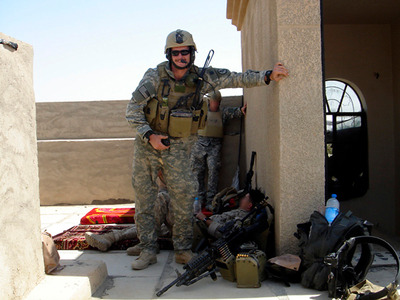 At the break of dawn on July 13, 2008, Staff Sergeant Ryan Pitts and other sentries manning his observation post noticed potential insurgents approaching their base. The entire valley soon erupted with gunfire from over 200 insurgents who had taken over the nearby town of Wanat, Afghanistan. Despite shrapnel injuries requiring a tourniquet, Pitts defended his post while calling in casualties and enemy positions. Pitts suffered multiple concussions and lost so much blood he could not stand on his own, but held off the insurgents and prevented them from gaining the high ground over his base. Wounded by shrapnel and hindered by continuous enemy fire, Corporal Dakota Meyer made multiple trips over the span of six hours – both in vehicles and on foot – to save four US teammates and dozens of Afghan soldiers in a brutal fight that would become known as the Battle of Ganjgal. 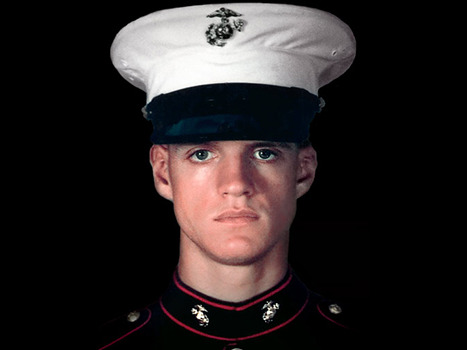 On September 15, 2011, Meyer became the second Marine to receive the Medal of Honour in the global war on terror – and the first living Marine since the Vietnam War. Fighting beside Meyer during the battle was Army Captain William Swenson, who also received the Medal of Honour for his actions that day. Over the course of six hours, Captain William Swenson risked his life several times in order to locate and evacuate wounded members of his team, fighting attacking enemy forces throughout the six-hour Battle of Ganjgal. 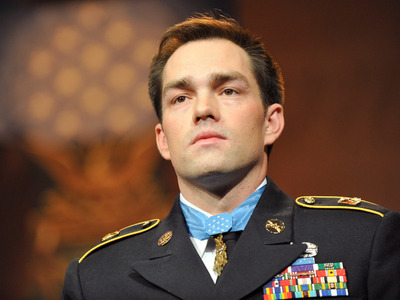 Staff Sergeant Clinton Romesha woke on the morning of October 3, 2009 to find that his remote Afghan outpost had fallen under attack. Although President Obama would later call the outpost “indefensible,” Romesha and his company-sized unit defended their base against over 300 Taliban fighters. Defending the outpost with Romesha that day was Staff Sergeant Ty Carter, who was also awarded the Medal of Honour, marking the first time since the Vietnam War that the military awarded its highest honour to two members fighting in the same battle. Staff Sergeant Ty Carter placed his life on the line to protect members of his unit who fell under attack by over 300 Taliban fighters at Combat Outpost Keating. Carter ran into direct fire several times to protect wounded soldiers, at one point carrying a teammate to safety on a stretcher before returning to fight. The unit was able to defend their outpost and push back the Taliban, and became one of the most highly decorated units in the war on terror, earning 37 Army Commendation Medals, 27 Purple Hearts, 18 Bronze Stars, nine Silver Stars and two Medals of Honour. 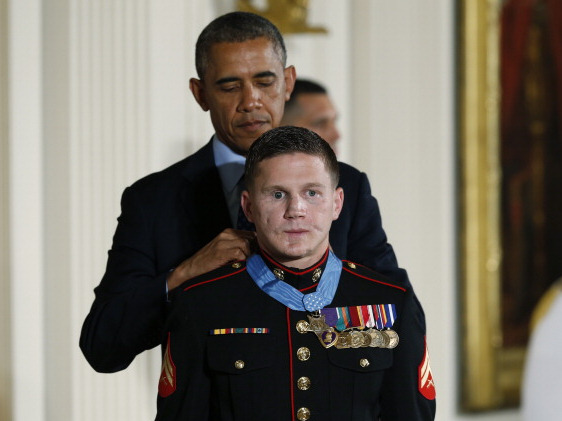 When a grenade landed near his post, Corporal William “Kyle” Carpenter lunged towards it to save his friend and fellow Marine. Carpenter miraculously survived the blast and spent over two and a half years in rehabilitation, requiring numerous surgeries after waking from a five-week coma. Army Captain Florent Groberg was thrown 20 feet through the air and knocked unconscious from the blast of a suicide vest. Groberg discovered the vest after confronting a man who had demonstrated suspicious behaviour in Asadabad, Afghanistan on August 8, 2012. He grabbed the vest and pushed the attacker away from his formation, suffering from severe injuries resulting from the bomb blast. Navy SEAL Senior Chief Petty Officer Edward Byers was part of the rescue mission of an American hostage that was held by the Taliban. During the rescue, Byers engaged in hand-to-hand combat with multiple enemy combatants and used his own body as a shield to protect the hostage from machine gun fire. Chip Somodevilla/Getty ImagesPresident Donald Trump awarded former Army Green Beret Ronald Shurer in a ceremony at the White House on October 1, 2018. Ronald Shurer, an Army medic-turned Green Beret, charged up the mountainside into enemy fire. Shurer treated and evacuated four soldiers from the mountain, using his own body to shield them from enemy fire and shrapnel. He then returned to the mountain to continue fighting against enemy forces. 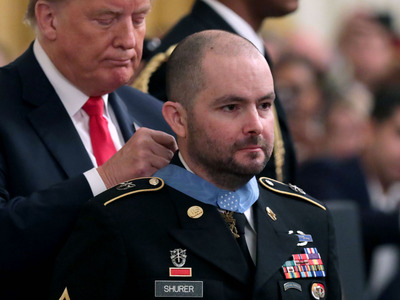 Shurer, who now serves as an agent for the Secret Service, was originally awarded the Silver Star for his actions. Upon hearing his story, President Donald Trump upgraded the award to the Medal of Honour.